Ranunculus fascicularis Muhl. ex Bigel. 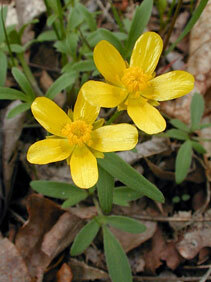 Also Called: Prairie tufted buttercup. Stems: Erect to ascending, single or in tufts, simple or little-branched, grey or whitish hairy below. Leaves: Basal leaves on stalks 1 to 4 inches long, pinnately 3- to 5-parted or some merely 3-lobed, ovate in outline, .6 to 2.2 inches long, .4 to 1.6 inch wide; leaf segments linear to oblong, entire or shallowly toothed or often 3-cleft; most ultimate segments narrow, linear to oblong, entire or shallowly lobed, stalked; tip blunt or rounded; stem leaves reduced when present, segments 1-3, narrow. Inflorescences: Cluster, sparse, 1- to 4-flowered, terminal. Flowers: Sepals 5, ovate, 1/4 to 1/3 inch long, greenish-yellow, spreading, appressed-hairy; petals 5, elliptic to oblong, 1/3 to 2/3 inch long, yellow; stamens usually 40-60. Fruits: Achenes, nearly circular, less than 1/8 inch long, smooth, 10-35 in spherical head. Habitat: Prairies and dry woods.